I’ve been busy putting mileage in these shoes and so here it is, ladies and gentleman I bring you a review of the Nike Fyknit Racer. 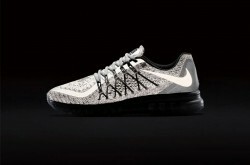 I confess, I have recently moved brand from adidas to Nike and it was this shoe that pretty much sealed the deal. To explain why, let me offer some background. It took me a while rotating through shoe types (structured, neutral, racing flat) and brands (Asics, Saucony, New Balance, adidas, Nike) before I found out what I liked in a shoe. I run in ‘racing flats’ on the road. Pretty much all the time. A racing flat broadly can be categorised as a shoe designed for, well, racing. They are minimally cushioned (oxymoron?). Lightweight. Designed for a higher cadence runner, a midfoot striker, neutral gait. adidas shoes I have liked and still like and wear from time to time, for example the adidas Adios 2 (had three pairs and ran them in two marathons) and adidas Takumi-Sen (had two pairs and ran a half marathon in them). Things I like about these shoes are that they are flat, light and firm… they fit the profile. Then adidas introduced the Boost sole. I tried hard. I really did. It cost me, literally. 2 pairs later realised that I just didn’t get along with them. They are just too soft. I don’t get the springy thing, it’s like an additional return of energy up through your knees when you foot strike. It doesn’t feel like cushion, more like running on a trampoline. Ever tried that? Exactly. And then, shock horror, it seems that adidas started to phase out the original Adios. What’s up with that?! So with my old Adios 2′s on their last legs, I had to shop around for an equivalent… and I stumbled upon the Nike Flyknit Racer. I haven’t looked back. 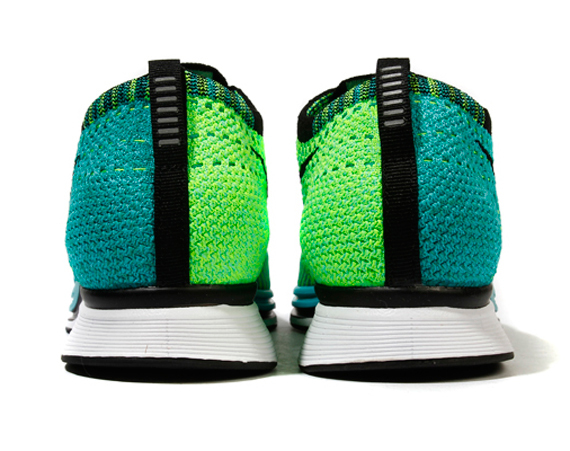 The Nike Flyknit Racer reads like this – 175g (ooo a bit lighter) and 24mm in the heel, 14mm in the forefoot so a 10mm drop. And they also run hard. 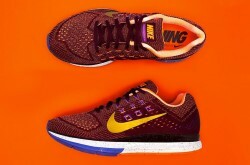 Nike use the ‘Phylon’ midsole throughout the sole of the shoe which is super resilient and firm. Another reason why I prefer the FKR and why it’s my go to shoe? The Flynit. It’s amazing. 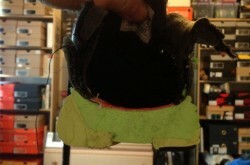 It’s light, it adapts to your footshape and is, obviously, amazingly breathable. This is really important for me. 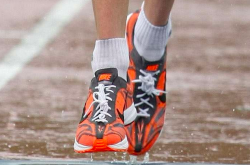 When you run a marathon your feet swell. 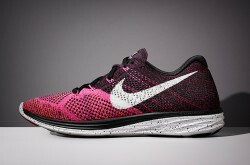 If you are wearing the Flyknit, you can start the race by lacing up tight and then the material will adapt. Not massively, you aren’t gonna ruin the shoe or gain a size just by running distance! But the upper is more elasticated than materials you find with other brands and this is a massive plus. Also the colourways are outrageous. 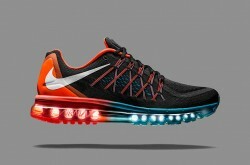 Nike say that the FKR is the shoe of choice for top marathoners. This isn’t quite accurate as a number of Nike pro’s are running in the Zoom Streak. Nike really pushed the original Zoom Streak and top marathoners for a long time were winning races in the ZS2 and then the ZS3. Now we are on the 5 and you see the odd pair here and there, but a number of top marathoners are still running in the ZS3! I would run the Zoom Streak to marathon, but actually, I find the ‘Phylon’ material in the sole of the FKR more responsive than the ‘Cushlon’ material which is a bit softer. 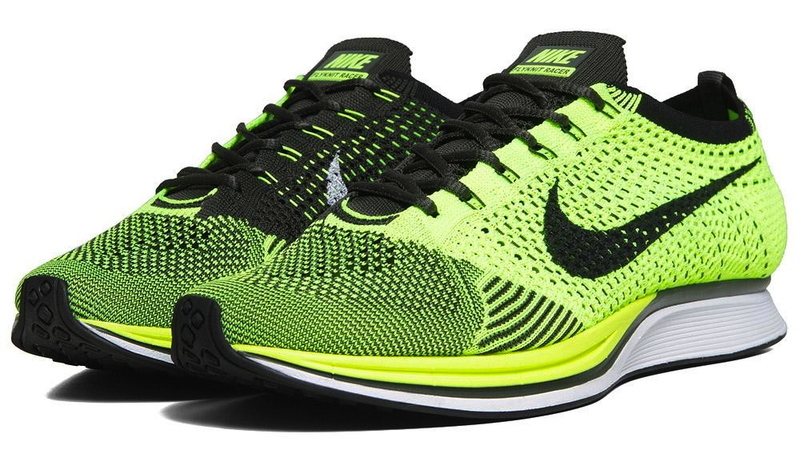 To summarise, the Nike Flyknit Racer is light, it has a firm sole, the drop is designed to run 5k and all the way up to marathon, the upper is inspired and they look, well, fly. I wear them when I’m not running also. Even at work to my boss’ chagrin. 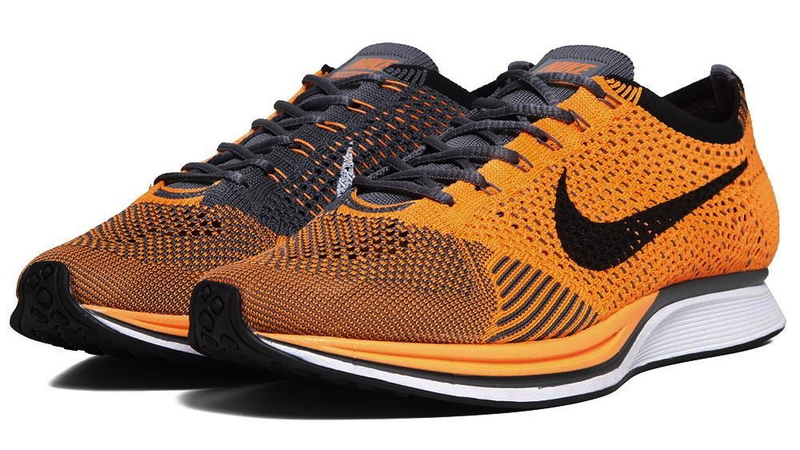 I ran (and pb’d) the Berlin marathon in a blue-black pair of this shoe, followed it up with an orange-pink New York marathon outing and pretty much run all my long runs (and a fair amount of short runs) in them. If you are looking for a fast racing flat, look no further. 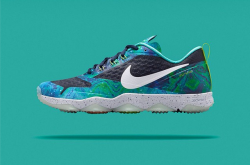 16 February Nike Zoom Streak 3 – Relic or Real Deal?